@ChasingASMBlog *raises hand* I remember asking about Identity Crisis. Thanks for raising your hand Jose! For more of my Reader Request entries this month, click here. If the current run of Superior Spider-Man has taught us anything, is that it takes more than just spandex and web shooters to be Spider-Man. While I’m certain Dan Slott and Stephen Wacker would vehemently disagree with me, it’s incredibly difficult for me to separate Spidey’s civilian identity, Peter Parker, from the superhero Spider-Man. Given Peter’s responsibility to be Spider-Man and to right the wrong he committed on that fateful day when he let a burglar run past him rather than stop him, I honestly can’t accept anyone else as Spider-Man. The late-90s eight-part “Identity Crisis” arc, which traverses Amazing Spider-Man #434-435, Sensational Spider-Man #27-28, Peter Parker: Spider-Man #91-92 and Spectacular Spider-Man #257-258, presents us with the inverse of the current status quo: rather than making somebody else Spider-Man, “Identity Crisis” separates Peter from the webs and provides our civilian hero with four alternative alter-egos, Ricochet, Hornet, Dusk and Prodigy. Peter is forced to assume these four wildly different personas after Norman Osborn puts a $5 million bounty on Spider-Man’s head for the murder of some low-life named Joey Z. 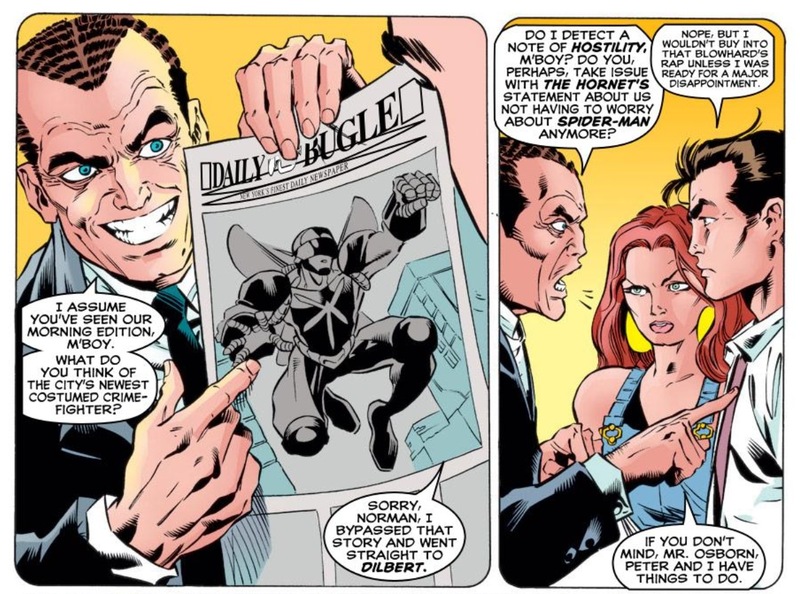 Of course, this is all one big set-up from Osborn and the actual murder was committed by long-time loser Paste Pot Pete, aka the Trapster (marking “Identity Crisis” as the second reader request that incorporates Trapster). Marvel released these comics as four two-part stories, with each title focusing on a different one of Peter’s new identities. That makes the arc easier to read when compared to the sprawling nature of “Cosmic Spider-Man” or “Lobo Brothers Gang War.” But that’s not to say I didn’t struggle to get through this story as I re-read it for this feature. The post-Clone Saga era of Spider-Man comics might be the most forgettable stories in the character’s history. I hesitate to call it inconsequential, because these issues did offer up the return of Osborn, who went on to be a major thorn in Spider-Man/Peter’s side going forward, and the death/return of Aunt (thanks to Norman), but I have to imagine only true continuity buffs like Slott would even dare to reference events from these eight issues. It’s not that “Identity Crisis” is a bad idea in theory, but outside of Norman’s bounty, none of the creative teams really offer us a reason “why” Peter decides to go with these personas. The Prodigy identity, despite the hideous prosthetic nose, is probably the truest to Peter’s character – he admits that he’s always wanted to be a larger-than-life superhero personality and Prodigy’s earnestness and do-gooder nature is very similar to a Superman or Captain America (heroes Peter idolized) – but the others all seem to be a mish-mash of different super powers and personas, without there being any cohesiveness beyond Peter’s necessity to not be Spider-Man until he can clear his name. Why is he a hornet or a guy who can go into stealth mode like Batman? Why did he choose to go with any of these ideas? ASM and Peter Parker: Spider-Man offer us “darker” personalities with Ricochet and Dusk, as Peter uses these new identities to go undercover in the criminal underworld, but the creative teams on both titles stop short of putting our hero in any situations that make him too uncomfortable in his environment. It’s not that I’m asking the creative teams to place Peter in full-on Wolverine-style anti-hero mode, but things just seem to resolve themselves a little too neatly during this arc. For example, in probably my favorite of the two-parters, in Peter Parker: Spider-Man Dusk needs to team-up with Trapster in order to get him to admit to setting Spider-Man up in the murder of Joey Z. (his lungs were filled with a “web fluid” which Peter correctly figured out was actually Trapster’s glue adhesive). Despite the fact that Trapster has long been regarded by Spidey and Human Torch a ike as a total joke, it’s nice to see old Paste Pot Pete hold all the cards in a relationship for a change. And in an interesting twist, Dusk and Trapster actually become sincere allies after Peter learns that Osborn has also put a bounty on Trapster’s head to further cover the trail to Joey Z’s murder. 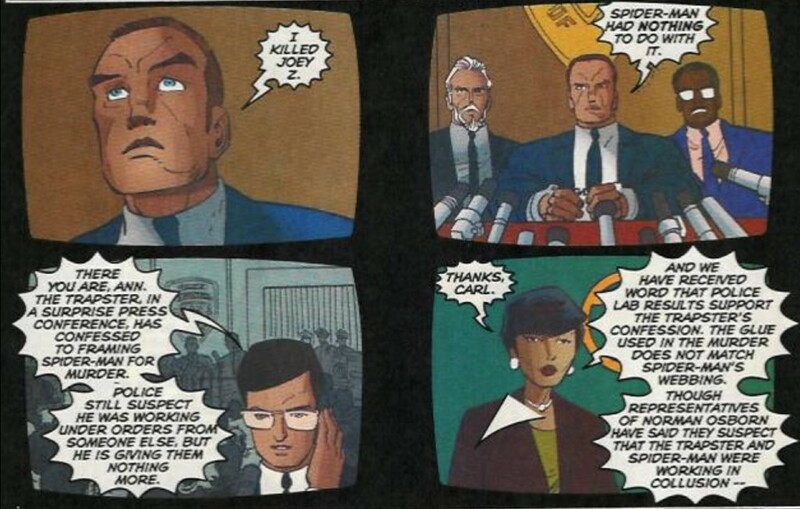 My biggest problem with this story is that after Peter’s audio evidence of Trapster and Norman’s confession is destroyed, he still manages to convince the villain to testify against Osborn and clear Spider-Man’s name of Joey Z.’s murder. That just feels a bit too fortuitous for me, especially since Peter’s ethics were being pushed a bit at the onset with the Dusk/Trapster team-up. And the real moral of all these stories is that while you can take the Spider-Man out of Peter Parker, you can’t take the Peter Parker out of Spider-Man. During a battle with the Vulture (as the Hornet), Peter starts cracking wise with the old-school villain, who immediately recognizes the banter as being distinctively Spider-Man. 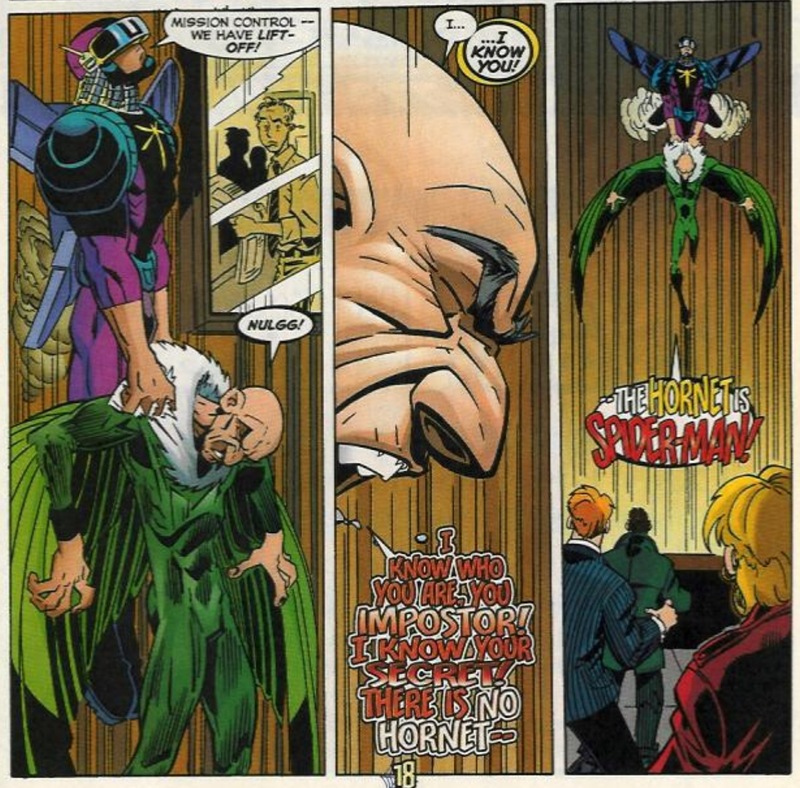 As the two physically engage each other, Norman overhears Vulture’s accusations and is noticeably steamed by the revelation. 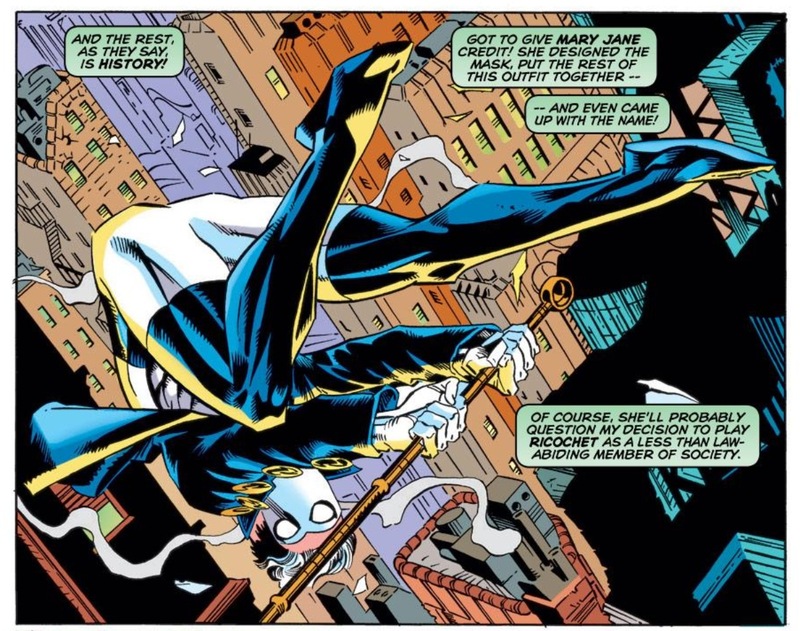 At issue’s end, Peter disposes of the Hornet costume, but it begs the question how Norman wasn’t able to put two-and-two together with all of the other “new superheroes” showing up in New York around the same time of Spider-Man’s disappearance. This storyline, and this general era of Spider-Man comics, also marks my least-favorite period of Norman’s characterization. I get that Marvel, after keeping him dead for decades, wanted to steer clear of only using Osborn as the Green Goblin in each and every appearance, but Norman as the Lex Luthor-ian power broker who seems to have Peter over a barrel at every turn, wears on my patience after a while. Many will note that Brian Michael Bendis created an entire new universe of Spider-Man comics in Ultimate Spider-Man centered on the same-style Norman Osborn villain, but at least in that instance, the characterization was consistent from day one. This era of Osborn comes across as creators re-writing history. Norman has always been a mad man who happened to be wealthy and powerful outside of his villain persona, but he was never a genius-level schemer. With that in mind, perhaps the “Identity Crisis” title isn’t referring to Peter/Spider-Man at all, but instead with Norman Osborn… Nah, I won’t give late-90s Marvel that much credit! To the credit of the writers (well not too much so, since some of them were responsible for the mess to begin with), they were kind of playing the hand they were dealt as far as Norman being mischaracterized. After having Norman execute a decade-long master plan of tormenting Peter, you can’t exactly turn around and have him go back to being a guy who has fits of insanity and throws bombs at people. I’ve always considered these four identities to each represent one part of the Spider-Man persona. Prodigy, as you said, is the classic do-good superhero Peter sees himself as, while Dusk is the shady anti-hero/villain Jameson and others see him as. Hornet uses the insect theme and uses his technology skills, while Ricochet is closest to his actual personality and highlights his athletic skills. Prodigy and Hornet are high-flying, spectacle heroes while Ricochet and Dusk are more anti-authoritarian street-level types. That being said, this story’s not that great, although the *idea* is an interesting one and I think it could be adapted into something good. 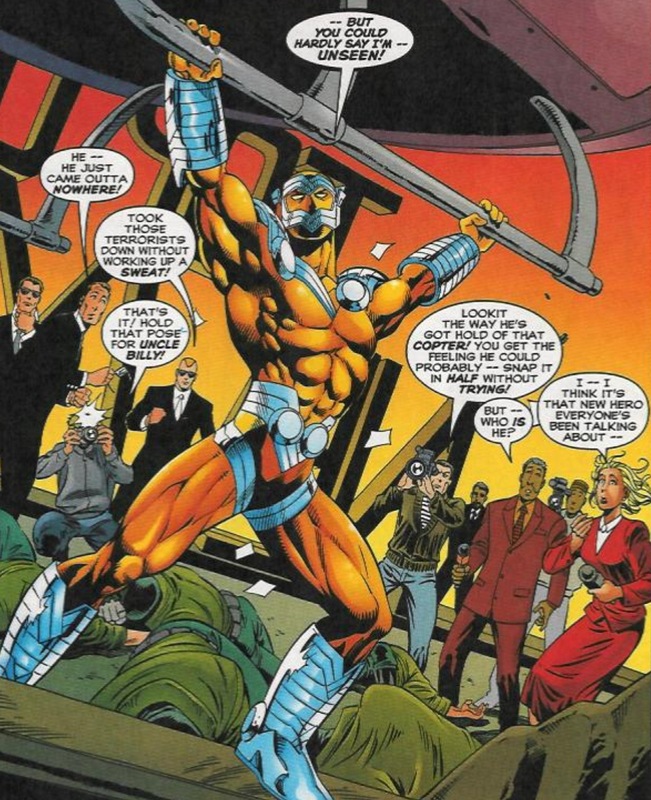 And even though they have a definite 90s influence, I think all four heroes have good designs and without them, we never would’ve gotten Slingers (which got weird near the end but is still a comic from my childhood I hold close to my heart; if nothing else, the main characters were solid and the first issue had one of the better gimmicks of the time).